In the first of our two race reviews this week, Steve Skinner tackles the Harry Hawkes 10 Mile for the third time. The race began in the 1980s (before Steve was even born) and it proved third time lucky for Steve who set a new personal best by almost two minutes and took sixth place overall. At £25 for an England Athletics affiliated runner I think the Harry Hawkes 10 Mile is great value. So many 10ks and half marathons cost over £50 nowadays. If you sign up on the day the price is £30, which I think is very reasonable for such a well organised race. Thames Ditton train station is just a 10 minute walk from Giggs Hill Green where the race village is situated. Trains run regularly from Waterloo to Thames Ditton and it only takes half an hour to get there. If you choose to drive, there are a number of large car parks around Giggs Hill Green. 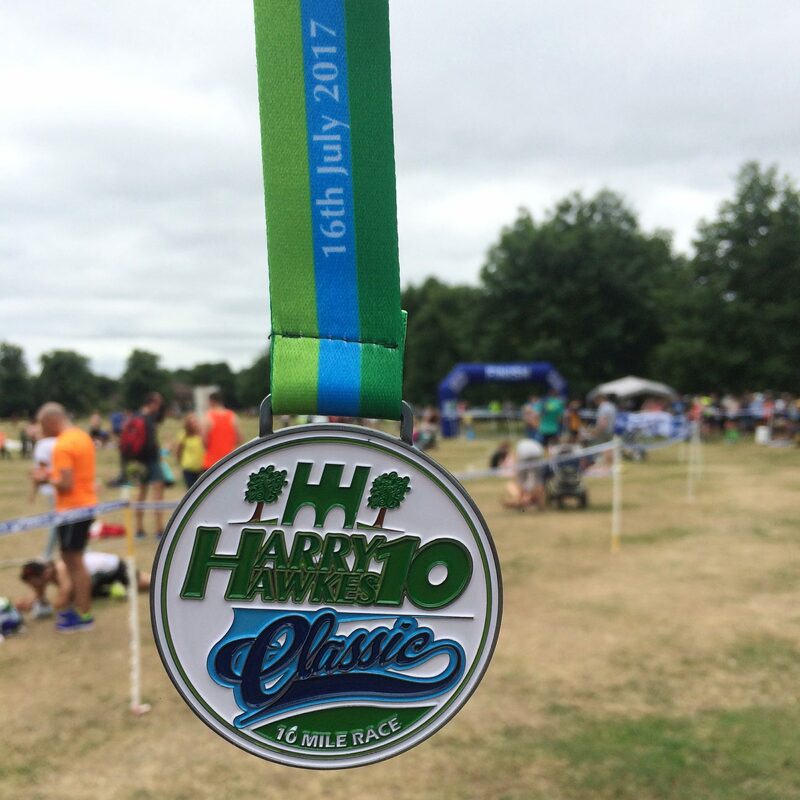 Runners who signed up before the 29th of June you could collect their number from Up & Running from Saturday 1st of July until Saturday 15th. As I was in the area on Saturday I went to the store to pick my number up. However, I would’ve been happy to collect my number on the day as it was a smooth process in the previous two years. The bag drop was simple; everyone wrote their race numbers on a label, attached it to their bags and put it where they wanted. After I crossed the finish line I went straight to the tent to pick up my bag. As the race is relatively small the bag drop is never an issue. As mentioned by someone else in the loo queue there were only 8 or so toilets for 640 runners, that’s 80 people per toilet. This was probably the only thing that let the event down. The queue was large and it was frustrating because there is definitely enough room on the Green for more toilets. Having said that, if the race were to hire more loos I guess the entry fee would rise and so they probably have a good balance. The route was really well marshalled and signposted. It was nice to run past a marshal and receive words of encouragement. The race starts at 9:30am and so is never going to attract huge crowds but running along the river and over Kingston Bridge friends and family come out to cheer. The support on the home straight is great! A large part of the route is alongside the River Thames. The views are great, especially of Hampton Court Palace, but you are exposed if it is wet and windy. Runners from most of the big London clubs take part and so it is quite a competitive race. There aren’t many 10 milers around so quite a few people take on the challenge for the first time. It is a great distance to get under your belt instead of jumping straight from a 10k to a half marathon. The Harry Hawkes 10 medal is always nice and chunky! After crossing the finish line there were bananas, water and a small goodie bag with sweets and race flyers. After the race, Thames Ditton Cricket Club host a BBQ on the Green for runners, friends and family. There are plenty of soft drinks available for a sugar hit. You have to pay for the BBQ so it’s a good idea to remember to take some cash. I look forward to the Harry Hawkes 10 Mile as it’s a good mix of club- and non-club runners. The course is flat and the atmosphere is nice and relaxed. If it doesn’t clash with any of my races next year I’ll be back again.